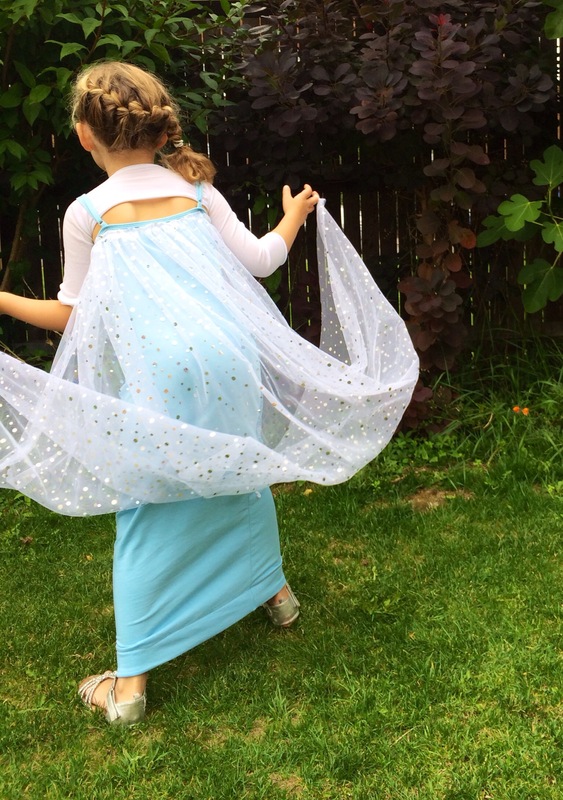 For her birthday Alice was given tickets for ‘sing a long a frozen’, at the Prince Charles Cinema, Leicester Square and as the audience is encouraged to wear appropriate dress up, we had a sudden demand for a Frozen dress for her to wear. Her sister had her Anna Coronation Dress I made for her (posted previously). I bought 2 ladies camisole vests size 8 in sky blue from Primark, to make the base of the dress. I cut across one from armpit to armpit and sewed this to the bottom of the other vest to make it dress length. These vests had adjustable bra type straps so I was able to reduce the length to fit Alice (and leave growing room). I bought a sparkly, sequinned net curtain from a bargain homeshop (can’t remember the name of it) for £6.99, this became the cape part of the dress. I used the whole width of the curtain and gathered it to fit the vest dress from front strap to front strap around the back and then sewed it on. I had the bits of light blue sparkly fabrics left over from a mermaid costume (I still haven’t posted about!). The sequinned one was part of a dress bought from eBay and the metallic fabric came from a top bought in a charity shop. I didn’t have enough of either to use just that so ‘patchworked’ the two fabrics onto the vest dress as appliqué. I tried sewing this on with my sewing machine, but it really didn’t like the sequins so after replacing the needle twice I resorted to hand sewing the pieces on and adding a few iridescent sequins that came in a mixed bag from Poundland. I was undecided about the need for the sleeves, as we were going to the sing along in August, but at the last minute took a pair of white sparkly tights from H&M size 13-14, and cut one leg off and removed the toe part to create a long tube, then cut a long slash half way along so Alice could put her arms into the two sleeves and have a piece of the tights fabric across her shoulders and back, which I think was quite successful. At the last minute I added two elastic loops to the corners of the cape, to go on her fingers so she was able to hold it up, so it wouldn’t snag on the escalators for the tube. She looked amazing and was very pleased with her Elsa dress, and we got lots of lovely comments on both the girls dresses, both on our way there and at the event, which was lots of fun and a great 5 year olds birthday treat. 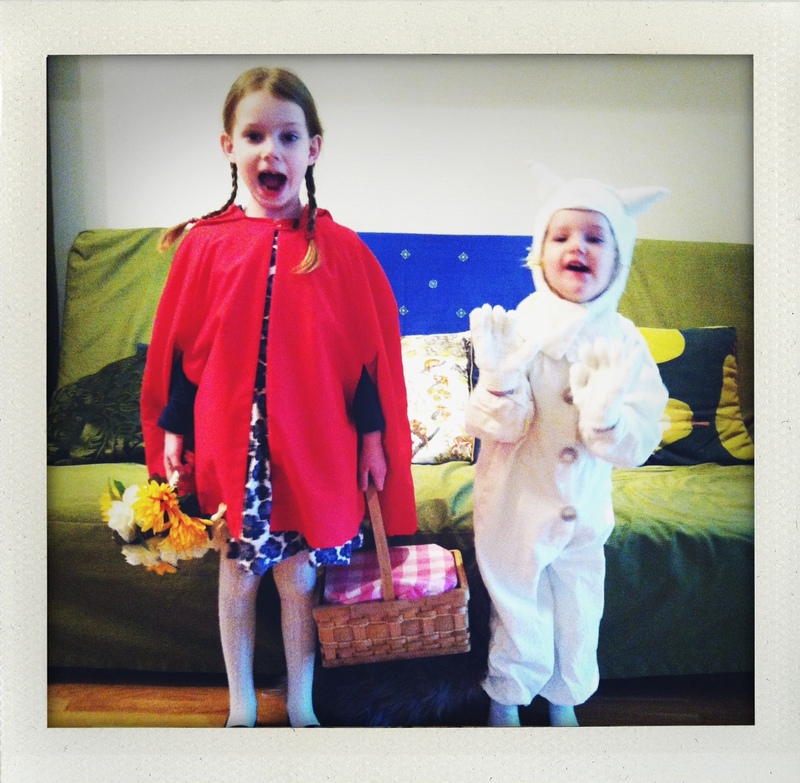 It was ‘World Book Day’ last week. Martha has been planning her costume since last year, and all the characters she has wanted to ‘be’ have all been a bit tricky. 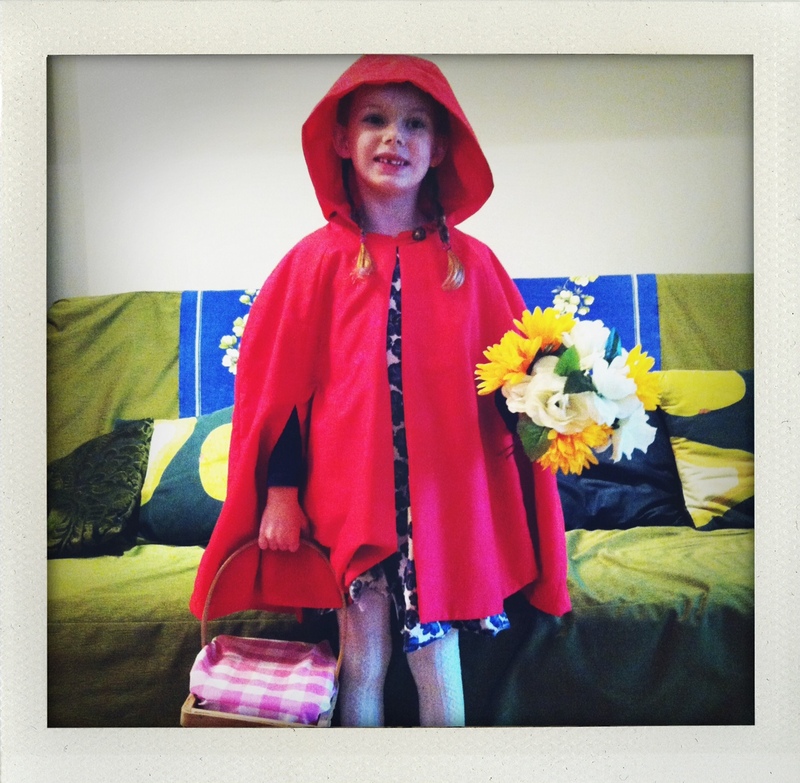 I suggested Red Riding Hood, as really there is only one important piece of costume (the red hooded cape). 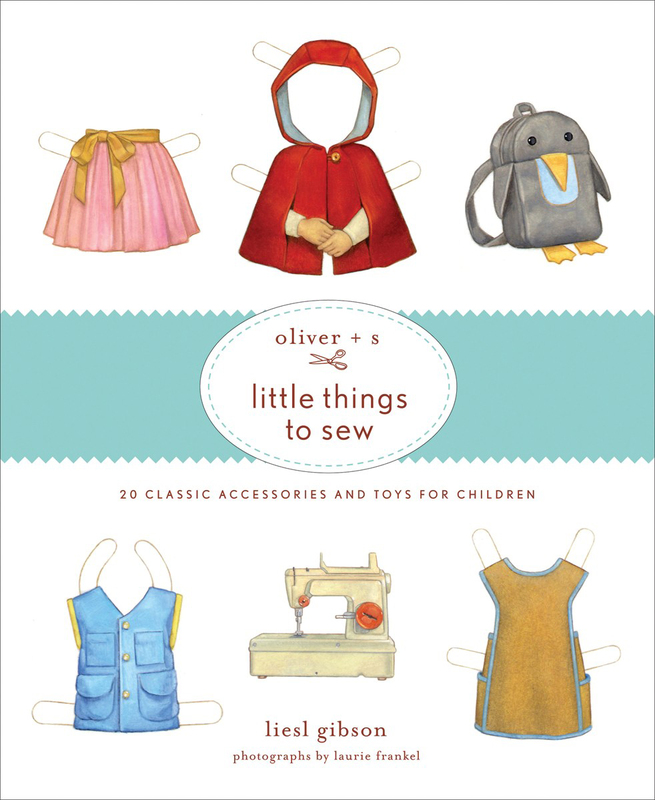 I used a pattern from ‘Oliver + S Little Things to Sew’ book by Liesl Gibson. (I used her pattern for the tutus I made the girls for their birthday outfits) Its a beautiful and very clever book, this was the first time I have used the patterns provided in the back of the book which you have to trace onto paper to cut the fabric. The red fabric is (of course) a single flat sheet from ASDA, Liesl’s pattern uses a very cute print as a lining but I lined this one in the same red sheet fabric. It came together really easily. Martha picked the button from a small selection of vintage buttons as the local charity shop. She wore a pretty blue floral pattern dress underneath (eBay) with cream tights and blue ballet flat shoes (Tesco). Her props were a bunch of flowers for Grandma (Poundland) and a basket with pink gingham cloth (left over from the patchwork quilts) with a box of gingerbread men for all her classmates. We bought the gingerbread men from tesco but mixed up some water icing and decorated them with leftover cake decorations. Alice went to Nursery in her Max from ‘Where the Wild Things Are’ outfit I made her for Halloween but I added the oversize cream buttons to the front of it. In the illustations of the book Max seems to have 5 buttons but the haberdashers only had 3 left of these.